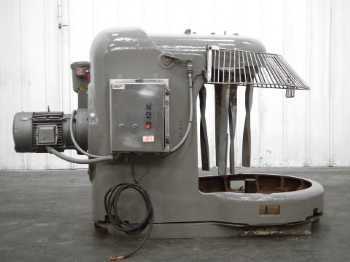 Spiral mixers with capacities larger than 100 gallons are best suited for larger batches of dough. Spiral mixers have an agitator that spins in a stationary position while the bowl rotates. A spiral mixer is a quick, efficient tool for mixing dough. Because they only mix one part of the dough at a time, the mixer does not affect the temperature of the dough as much as other types of mixers. Spiral mixers are great for mixing large amounts of dough.